I believe that it's best to leave some things to the experts, and for that reason, I don't often make chocolates. But truffles are another thing. They're relatively easy to make and the joy they bring to everyone is disproportionate to the effort. You could omit the hazelnut praline altogether, but it provides a wonderful textural contrast to the rich, smooth ganache and will leave your friends shaking their heads in disbelief that you made these glorious orbs yourself. 1. Line a small baking tray with baking paper and set aside. 2. Place a tablespoon of water in a small saucepan and sprinkle the sugar on top. Place the pan over medium heat, swirling gently until the sugar dissolves. When it begins to bubble at the edges, add the hazelnuts and stir gently. The sugar will begin to crystallise; keep stirring gently until the crystals begin to dissolve and gradually turn into caramel. When it is golden brown, remove the saucepan from heat and tip the mix out onto the lined tray. Allow to cool completely (about 30 minutes) then transfer to a food processor and process until finely crushed. Set aside in a small bowl. 4. When the truffle mixture is set but still malleable, use a teaspoon to scoop out portions of about 15g each, then shape into balls with your fingers (your palms tend to be warmer and melt the chocolate). Place on a tray lined with baking paper and chill in the fridge while you melt the chocolate for the coating. 5. Melt 75g of the extra 100g chocolate over a pan of gently simmering water, then remove from heat and stir in the remaining 25g. Stir until melted and combined, then dip the truffles one at a time into the melted chocolate and return to the lined tray. 6. 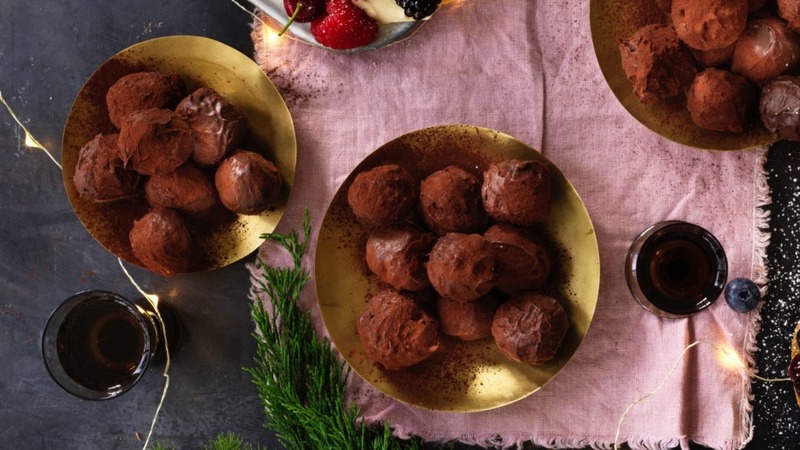 When all of the truffles have been dipped, roll each ball in the palms of your hands to ensure that the chocolate coating is nice and thin and sets evenly – it is messy work, but well worth it to get the experience of biting into the thin shell later. Place on a fresh sheet of baking paper, then, just before the chocolate sets completely, dust with cocoa powder. 7. Store in the fridge for up to 10 days. Tip: if you're short on time, cut the ganache into squares, lightly dust with cocoa, and serve on a small tray. You won't get the pleasure of biting through the thin chocolate shell of the full recipe, but it is December, and one needs to be pragmatic. If you like this recipe, try my Christmas horns of plenty with Vin Santo cream.